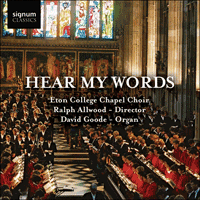 Hear my words ye people by Hubert Parry, a former chorister at Eton College is the first track on the album featuring some of the best-loved anthems in the church repertoire, beautifully performed by the Eton College Chapel Choir. The choir, formed in the 14th century, has changed a great deal since the choir school was succeeded by a music scholarship system, designed to facilitate talented choristers with their education. Although life has changed at Eton, the music passed down over five hundred years still possesses a power to stir. After the justified success of Blest Pair of Sirens in 1887, Parry could reasonably be regarded as the leading choral composer in England. Hear my words, ye people was written for the Diocesan Choral Festival in Salisbury Cathedral in 1894, in which choirs were drawn together from across the diocese, with the Cathedral Choir serving as the smaller semi-chorus who feature to fine antiphonal effect in the latter stages of the piece. From the opening pages, it shows Parry’s gift not only for organising large-scale structures thematically, but also, more particularly, for vocal declamation at the smaller level, with phrase balancing phrase. Somewhat after the manner of a cantata by Parry’s beloved Bach, substantial choral sections are interleaved with two arias, one for baritone and one for trebles, which in their different ways are shaped with impressive command. The conclusion of the work, ‘O praise ye the Lord’ has entered the liturgical repertoire as a hymn, complete with elaborate organ pedal part. As the English anthem gradually developed after the various stages of the Reformation in England, a form that emerged gradually was the ‘verse’ anthem. Interspersing solo and tutti sections, this genre flourished in the Elizabethan era as well as in Restoration times; its later descendants were the large-scale anthems of S. S. Wesley and indeed Parry. Byrd’s Teach me O Lord is an example of charming simplicity, wholly appropriate to its text and a gentle counterpart to the grandeur of Hear my words. An important contemporary of Parry was an Irishman, Charles Villiers Stanford, Professor of Music at Cambridge and of composition at the Royal Academy of Music at the turn of the twentieth century. Amidst his large output of nearly 200 works, Stanford is probably best known today for his Anglican service settings, which continue to form the backbone of the cathedral repertoire. The Magnificat in G is both unusual in its scoring for treble solo and chorus—a depiction, it is said, of the Virgin Mary at her spinning wheel (this perhaps an appropriation of Schubert’s Gretchen? )—and highly effective in the right performance, with an attractive freshness lacking in much of the Anglican music of the period, and with only the merest suggestion of operatic sentimentality in the interaction with the choral group. Completing this trio of solos is the Benedictus from Haydn’s Missa Brevis St. Johannis de Deo, also known as the Little Organ Mass, written at some point in the 1770s. In contrast to the highly compressed nature of the rest of the Mass (it has been suggested that it was perhaps considered desirable to get through the longer portions as quickly as possible) the Benedictus, traditionally the moment in the Mass when the Host was venerated, is treated with elaborate, even operatic, artifice. The treble solo duets throughout with an organ part that is decidedly Rococo in its gestures and its ornamentation. Malcolm Boyle was a chorister at the Eton Choir School, before pursuing a career in church music in St. George’s, Windsor Castle and Chester Cathedral. His setting of Psalm 65, Thou, O God, art praised in Sion, opens in extrovert manner with an organ solo not unlike that of Parry’s Hear my words; the middle section (‘Thou wilt keep him’) is a longbreathed and memorable melody for full trebles, before the grandiose style returns for the close. The early eighteenth century was generally a rather fallow period in English church music, in which the fashion for German and Italian music, particularly opera, had diluted the native product. Thus the technical strength and expressive power of Lord, let me know mine end, a setting of verses from Psalm 39 by Maurice Greene (Organist of St. Paul’s Cathedral and Master of the King’s Music in the mid-eighteenth century) are all the more remarkable. The walking bass that persists throughout the piece can be taken as an evocative depiction of life’s journey; over it, Greene crafts a series of thoughtful imitative points with, at the centre, a treble duet of some beauty. Eton was founded by King Henry VI in 1440; and the prayer written by him, known as the Founder’s Prayer, has often been considered a model of devotion. It was set by Henry Ley, Precentor and Director of Music at Eton from 1926-1945, to music of comparably moving simplicity which makes its timeless effect partly through Ley’s use of the Dorian mode, hovering between D minor and C major, and partly through rhetorical handling of phrase lengths. Thomas Tomkins was Organist of Worcester Cathedral from 1596, in the midst of the glory days of Elizabethan music, to the 1640s, well into the culturally and religiously lean times of the Commonwealth. Out of the deep was included in Musica Deo Sacra, a substantial posthumous publication probably compiled by his son, Nathaniel, in 1668; but this is Tomkins’ original version, in five parts. It is a highly atmospheric verse anthem which is, as it were, pulled steadily out of the depths by the solo line, drawing in other soloists as it progresses. Tomkins’ quotation of Gibbons’ famous madrigal ‘The silver swan’ (using the passage of music which sets the words ‘more geese than swans now live, more fools than wise’) perhaps suggests dismay at the state of the nation. We return to later periods, and Stanford. Despite the fame of his service settings, The Grove Dictionary of Music and Musicians asserts, not without substance, that ‘in the writing of a song [he] attained more easily and frequently than in any other branch of creation the absolute fusion of thought and feeling sought by composers.’ His set of 6 Bible Songs Op. 113 (from 1909, thus rather late in his career) were possibly inspired by the Biblical Songs of Dvorák. The last and most ambitious of the set, A Song of wisdom, takes its text from the Apocrypha. Sung here by a solo treble, this matches Parry’s declamatory skill in its atmosphere, rhetoric and building of climaxes; particularly notable is the high A flat at ‘Come unto me’. In its typical blend of devotion and sensuality, César Franck’s Panis angelicus fits the description given to the Mass for 3 voices by Franck’s devoted pupil Vincent d’Indy: ‘…a curious dream, half mystic, half secular’. Franck’s balancing of phrases in this piece dealing with the Blessed Sacrament is certainly achieved with skill; in addition, his use of canon between soloist and chorus at the reprise is a personal hallmark seen also in the finale of his violin sonata in the same key. This piece originally featured the atmospheric combination of organ, cello and harp. It was the recording by the Temple Church Choir and its treble soloist Ernest Lough that made Mendelssohn’s ‘O for the wings of a dove’ a smash hit in England in the 1920s. The complete anthem, Hear my prayer, a setting of words from Psalm 55, was written in 1844 at the request of William Bartholomew for his concerts in Crosby Hall, and subsequently published in Berlin in a German translation. The piece is laid out on a substantial scale, almost that of a small cantata, with the questioning phrases of the opening section, and the near-operatic drama of the central scena, resolved in the pastoral serenity of the final part. Another pastoral treble solo opens and closes Lennox Berkeley’s version of Psalm 23, The Lord is my Shepherd. This was written in 1975 towards the end of his career, when he had adopted a retrospective style from some fifty years earlier; the static harmony, often based on pedal points, and the gently flowing counterpoint remain, however, an apt and evocative response to the text. 1902 was the date when the Hill organ in Eton College Chapel (possibly the finest English Romantic organ in England) found its present form. But larger events were afoot, since Queen Victoria had died the previous year. Parry’s earlier work, as well as the positions he had held at Oxford and the Royal College of Music, made him the natural choice to provide an anthem for the Coronation of Edward VII. (Elgar, for example, was only just becoming known as an orchestral composer.) He responded as to the manner born. I was glad—its text a neat choice from Psalm 122, by which the rejoicing of God’s people at the temple of Jerusalem is appropriated for a much later occasion of national rejoicing—conveys not only the pomp of the Coronation but also the sweep and grandeur that one associates with Empire as a whole. Life at Eton, and in the British ‘Establishment’ as a whole, may have changed significantly since 1902. For a start, most of the boys appearing on this recording are hard-working music scholars, granted substantial bursaries to facilitate their education. And yet the music gathered here from this period, and indeed that of the English choral tradition as handed down over five hundred years, has a power to stir; it refuses to be sidelined as dated or parochial, but remains vital, vigorous and admirably ‘fit for purpose’.